We are proud to report that we were presented with the Directory for Social Change’s Influencer Award at a ceremony on 7 December 2015. The award was given for the work of the charity in the three months following the Nepal earthquakes in late April this year. Through our local team, headed by country manager, Jimmy Lama, more than 3000 families received emergency supplies of blankets, tarpaulins, food and solar lighting. Shortly after, the charity funded the construction of 205 Temporary Learning Centres, aimed at getting children back into a semblance of normal education. We are now been given a mandate by the Nepali Government to help re-build and re-equip 15 schools. 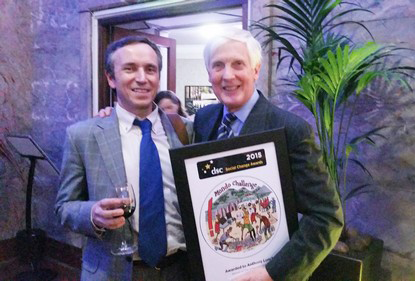 The DSC awards are given annually in London. 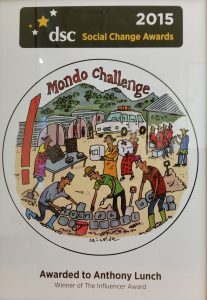 MondoChallenge were runners up in 2013 but on this occasion, we won the Influencer Award.Â The awards are given after a public voting campaign. At the awards ceremony Founder and Chief Executive, Anthony Lunch, spoke of his current focus and vision for the future: “We aim to help more children get a better education in each of the countries where we work. Partly this means providing better classrooms and facilities, partly ensuring the kids have books, games equipment, but particularly helping provide more teachers, and better teacher training. In the aftermath of the earthquake, these are challenging tasks!“. Debra Allcock Tyler, Chief Executive of the Directory of Social Change who host the Social Change Awards said “In today’s society people such as Anthony, act as ‘spirit-igniters’; acting to ignite passion and commitment in others“.